Two million people work in Britain's construction industry, making it the country's biggest industry. Corporate identity is therefore an important factor. That is why we offer site boards, temporary road traffic signs, vehicle graphics, banners and hoardings incorporating company logos and messages using large format digital printing on a variety of materials, Recyclable alupanel, Corex, Foamex, Hi-gloss PVC, self-adhesive vinyl and heavy duty PVC Banners for every environment. The first impression a potential client is given when arriving at your corporate headquarters or premises or site can reflect on your own performance as a business. A well thought out, coordinated corporate identity is essential in portraying the right image. G&G Signs can provide a comprehensive, countrywide consultation, design, installation and maintenance service for all your internal and external signage needs. 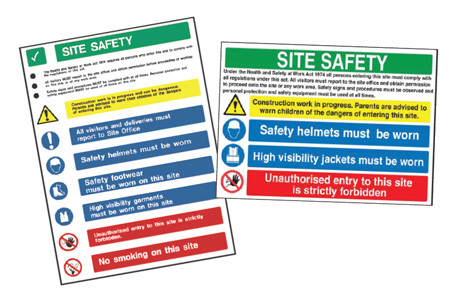 From initial welcome signage, through to internal directory and office identification systems, G&G signs can offer a complete service for a single site or a nationwide identity project. We will help you to create a good first impression and with over 30 years experience in the signage business, we know how important it is to establish a long-lasting and credible image. Our clients demand the highest standards in design and manufacture which we achieve through continuous investment in technology and staff training. G&G Signs supply to all the top uk builders.